All cats scratch, but some can become quite destructive, causing owners a lot of frustration and raising the question of whether it's really possible to share a home with a particular cat. Scratching, in fact, is one of the top reasons cats are either declawed, abandoned, or surrendered to shelters. Cat lovers often face a quandary when they also love their nice furniture and thick, plush carpeting. No one wants to live with sofa arms and drapes shredded and tattered, or carpet strings pulled up, yet few of us are willing to give up our cats, either. While it is possible to declaw a cat, it is never a good idea. Not only is the procedure painful, but it is also harmful to your pet's health. Instead of taking such a draconian action, you can train your cat to scratch appropriately while also keeping its claws at a minimum length. Clipping claws. You can purchase cat claw clippers at your local vet, and they are usually easier to use than human nail clippers. Start with a relaxed, sleepy cat, sharp clippers, and a good light source, for best results. Hold your cat securely in your lap, and clip one paw at a time. Press the paw pad and your cat's claws will extend. Clip off just the sharp, hooked portion of the claw, being careful not to nick the quick (flesh). Determine where and what your cat likes to scratch. Each cat has its own preferences; by watching your cat you can determine what kind of surface it like to scratch and where it usually does the most damage. You can then reproduce similar surfaces and scratching posts in similar locations to attract your cat to acceptable scratching areas. Remove temptation. Wash, cover, and/or move items your cat typically scratches to make them less accessible and attractive. Consider rewards and consequences. It's always preferable to reward your cat for good behavior rather than offer consequences for poor behavior. Treats for scratching in the right places can be very effective. Only if absolutely necessary, consider using a squirt bottle or other consequence to teach your cat to stay away from certain areas. Just like humans, cats need exercise, and scratching posts provide the ideal format. Cats stretch and pull against the scratching surfaces to limber their bodies, as well as to "sharpen" their claws (by removing the sheaths that cover them). Be generous with scratching posts - cats love and need a variety of surfaces and planes, so scatter a few throughout the house. Every cat should own several scratching posts, of varying sizes, angles, and surfaces. 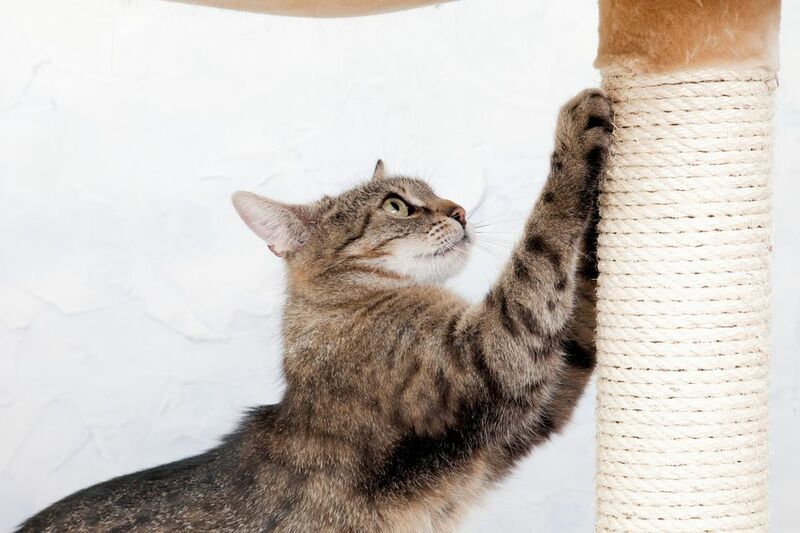 Scratching posts are essential to cats, for needed exercise, stress relief, and claw management, and will save wear and tear on furniture and carpeting, as well. With scratching posts, costs are not necessarily a factor, as the inexpensive corrugated cardboard pads are a favorite with some cats. It's fine to purchase an inexpensive scratching post; there's really no need to buy high-priced towers. Place the scratching post in the same location as your cat has already been scratching. If your cat enjoys catnip, rub a little on the scratching post to attract your pet. When your cat uses the scratching post reward it with treats, kinds words, and cuddles. Cats need to scratch; it is an ingrained need to help maintain their main source of defense and to develop strong sinewy muscles and connective tissue. Destructive scratching need not be a problem if you recognize and respect this need to scratch and provide allowable alternatives to your furniture. You can also trim claws, use soft nail caps, and use other means of discouraging destructive scratching.